The undersigned is directed to refer to this Department’s OM No 28020/1/2010 dated 21.07.2014 on the above subject and to say that guidelines / instructions regarding Probation and Confirmation have been issued from time to time. It is now proposed to farther consolidate these instructions to provide clarity and ease of reference. 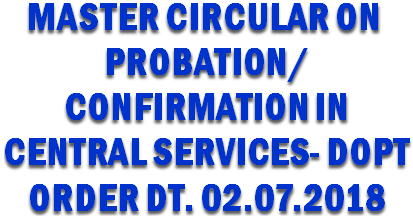 Subject: Master Circular on Probation/Confirmation in Central Service - Reg. The undersigned is directed to refer to this Department's O.M. No. No. 28020/3/2010-Estt(C) dated 21.07.2014 wherein consolidated instructions on Probation/Confirmation where issued. It has been decided to further consolidate the instructions/guidelines in relation to probation and confirmation as a Master Circular to provide clarity and ease of reference. The Master Circular issued vide O.M. dated 21.7.2014 has been suitably updated as on date and the same is enclosed. The list of O.Ms. issued till date is at Appendix. Promotion from one grade to another but within the same group of posts e.g. from Group ‘C’ to Group ‘C’. 2 years or the period of probation prescribed for the direct recruitment to the post, if any. 11. A person appointed to a post on probation shall be entitled to leave under the rules as a temporary or a permanent Government servant according as his appointment is against a temporary or a permanent post. Where such person already holds a lien on a permanent post before such appointment, he shall be entitled to leave as a permanent Government servant. 12. The period of joining time availed of by a probationer on return from leave should be counted towards the prescribed period of probation if but for the leave, he would have continued to officiate in the post to which he was appointed. 14. If during the period of probation, a probationer has not undergone the requisite training course or passed the requisite departmental examinations prescribed (proficiency in Hindi, etc. ), if any, the period of probation may be extended by such period or periods as may be necessary, subject to the condition that the total period of probation does not exceed double the prescribed period of probation. 26. The date from which confirmation should be given effect to is the date following the date of satisfactory completion of the prescribed period of probation or the extended period of probation, as the case may be. The decision to confirm the probationer or to extend the period of probation as the case may be should be communicated to the probationer normally within 6 to 8 weeks.Confirmation of the probationer after completion of the period of probation is not automatic but is to be followed by formal orders. As long as no specific orders of confirmation or satisfactory completion of probation are issued to a probationer, such a probationer shall be deemed to have continued on probation. 29. Since there will be- no confirmation on promotion before an official is declared to have completed the probation satisfactorily, rigorous screening of his performance Should be made and there should be no hesitation to revert, a person to the post or grade from which he was promoted if the work of the officer during probation has not been satisfactory. 30. A Government servant appointed by transfer would duly have been confirmed in the earlier post. fir such a case further confirmation in the new post would not be necessary and he could be treated as permanent in the new post Where, however, a Government servant who has nut already been confirmed in the old post is appointed by transfer, if would be necessary to confirm him in the new post in such cases, he may be considered for confirmation after watching him for two years. Within that period of two years, the officer would earn two reports in the new grade and the DPC may consider his case for confirmation on the basic of these APARs.